Die Veneris, 4 Junii, 1641. Bp. of Bath and Wells. And the Petition from the Town of Cambridge is referred to this Committee. That the Committee for the Bishop of Bath and Wells do meet on Monday next, at Two post meridiem. 4. That the Earl of Bridgewater ought to make Reparation to Sir John Corbett. 6. That the Lords, and others of the Privy-council, whose Hands are at the Warrant for the Commitment of Sir John Corbett, ought to join in making this Reparation; viz. Lord Cant', Lord Coventry, Rich. Eboric', Manchester, F. Cott. Edw. Lord Newburgh, H. Vane, F. Windebanke. Resolved, upon the Question, That Mr. Harris, Clerk of the Peace of the County of Salop, be forthwith sent for, as a Delinquent, by the Serjeant at Arms attending on this House. Ordered, That the same Committee unto which this Business was referred, shall forthwith prepare the Transmission of this Cause to the Lords. The Petition of Alderman Abell was read. The Certificate of the Inhabitants was read; and referred to the Committee for Recusants convict: And Mr. Stephens is added to that Committee. 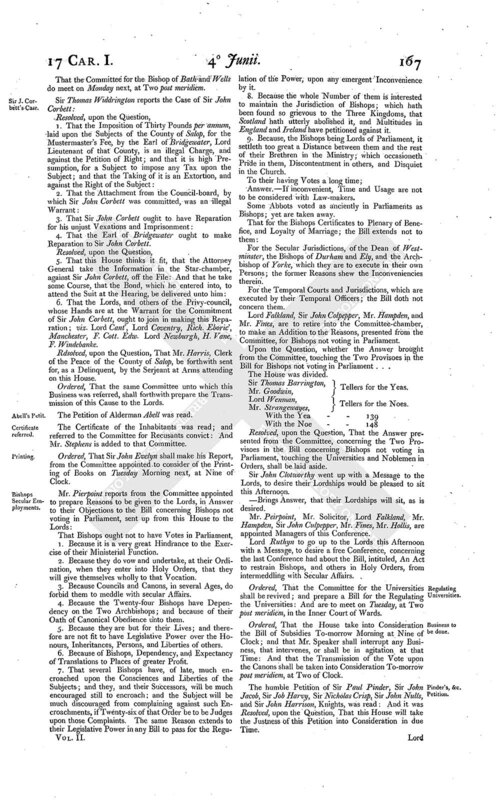 Ordered, That Sir John Evelyn shall make his Report, from the Committee appointed to consider of the Printing of Books on Tuesday Morning next, at Nine of Clock. 1. Because it is a very great Hindrance to the Exercise of their Ministerial Function. 2. Because they do vow and undertake, at their Ordination, when they enter into Holy Orders, that they will give themselves wholly to that Vocation. 3. Because Councils and Canons, in several Ages, do forbid them to meddle with secular Affairs. 4. Because the Twenty-four Bishops have Dependency on the Two Archbishops; and because of their Oath of Canonical Obedience unto them. 5. Because they are but for their Lives; and therefore are not fit to have Legislative Power over the Honours, Inheritances, Persons, and Liberties of others. 6. Because of Bishops, Dependency, and Expectancy of Translations to Places of greater Profit. 7. That several Bishops have, of late, much encroached upon the Consciences and Liberties of the Subjects; and they, and their Successors, will be much encouraged still to encroach: and the Subject will be much discouraged from complaining against such Encroachments, if Twenty-six of that Order be to be Judges upon those Complaints. The same Reason extends to their Legislative Power in any Bill to pass for the Regulation of the Power, upon any emergent Inconvenience by it. 8. Because the whole Number of them is interested to maintain the Jurisdiction of Bishops; which hath been found so grievous to the Three Kingdoms, that Scotland hath utterly abolished it, and Multitudes in England and Ireland have petitioned against it. 9. Because, the Bishops being Lords of Parliament, it settleth too great a Distance between them and the rest of their Brethren in the Ministry; which occasioneth Pride in them, Discontentment in others, and Disquiet in the Church. Answer.-If inconvenient, Time and Usage are not to be considered with Law-makers. Some Abbots voted as anciently in Parliaments as Bishops; yet are taken away. For the Secular Jurisdictions, of the Dean of Westminster, the Bishops of Durham and Ely, and the Archbishop of Yorke, which they are to execute in their own Persons; the former Reasons shew the Inconveniencies therein. For the Temporal Courts and Jurisdictions, which are executed by their Temporal Officers; the Bill doth not concern them. Lord Falkland, Sir John Colpepper, Mr. Hampden, and Mr. 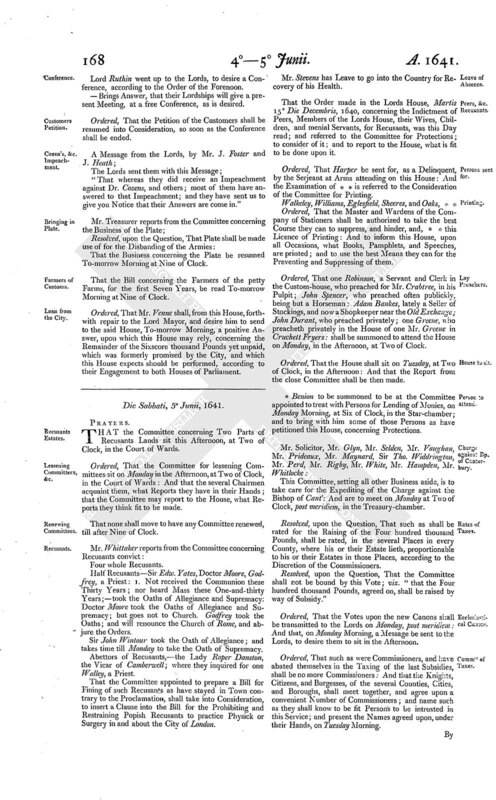 Fines, are to retire into the Committee-chamber, to make an Addition to the Reasons, presented from the Committee, for Bishops not voting in Parliament. Upon the Question, whether the Answer brought from the Committee, touching the Two Provisoes in the Bill for Bishops not voting in Parliament ... The House was divided. Sir Thomas Barrington, Tellers for the Yeas. Lord Wenman, Tellers for the Noes. Resolved, upon the Question, That the Answer presented from the Committee, concerning the Two Provisoes in the Bill concerning Bishops not voting in Parliament, touching the Universities and Noblemen in Orders, shall be laid aside. Sir John Clotworthy went up with a Message to the Lords, to desire their Lordships would be pleased to sit this Afternoon. - Brings Answer, that their Lordships will sit, as is desired. Mr. Peirpoint, Mr. Solicitor, Lord Falkland, Mr. Hampden, Sir John Culpepper, Mr. Fines, Mr. Hollis, are appointed Managers of this Conference. Lord Ruthyn to go up to the Lords this Afternoon with a Message, to desire a free Conference, concerning the last Conference had about the Bill, intituled, An Act to restrain Bishops, and others in Holy Orders, from intermeddling with Secular Affairs. Ordered, That the Committee for the Universities shall be revived; and prepare a Bill for the Regulating the Universities: And are to meet on Tuesday, at Two post meridiem, in the Inner Court of Wards. Ordered, That the House take into Consideration the Bill of Subsidies To-morrow Morning at Nine of Clock; and that Mr. Speaker shall interrupt any Business, that intervenes, or shall be in agitation at that Time: And that the Transmission of the Vote upon the Canons shall be taken into Consideration To-morrow post meridiem, at Two of Clock. 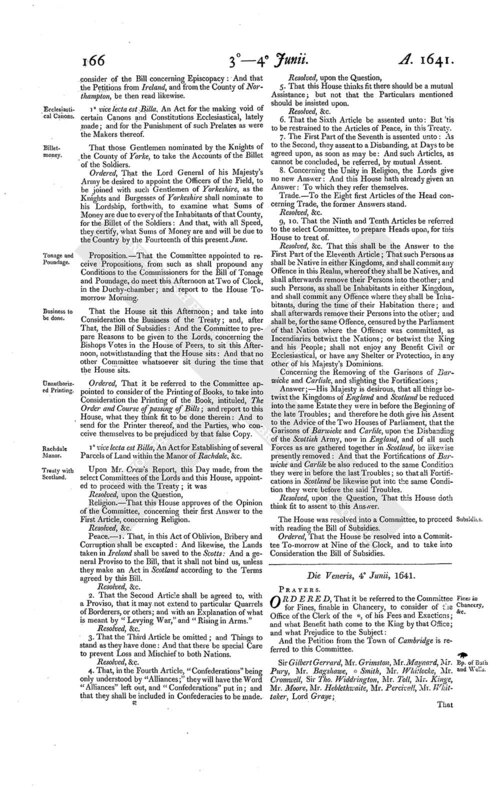 The humble Petition of Sir Paul Pinder, Sir John Jacob, Sir Job Harvy, Sir Nicholas Crisp, Sir John Nulls, and Sir John Harrison, Knights, was read: And it was Resolved, upon the Question, That this House will take the Justness of this Petition into Consideration in due Time. Lord Ruthin went up to the Lords, to desire a Conference, according to the Order of the Forenoon. - Brings Answer, that their Lordships will give a present Meeting, at a free Conference, as is desired. Ordered, That the Petition of the Customers shall be resumed into Consideration, so soon as the Conference shall be ended. "That whereas they did receive an Impeachment against Dr. Cozens, and others; most of them have answered to that Impeachment; and they have sent us to give you Notice that their Answers are come in." That the Business concerning the Plate be resumed To-morrow Morning at Nine of Clock. That the Bill concerning the Farmers of the petty Farms, for the first Seven Years, be read To-morrow Morning at Nine of Clock. Ordered, That Mr. Venne shall, from this House, forthwith repair to the Lord Mayor, and desire him to send to the said House, To-morrow Morning, a positive Answer, upon which this House may rely, concerning the Remainder of the Sixscore thousand Pounds yet unpaid, which was formerly promised by the City, and which this House expects should be performed, according to their Engagement to both Houses of Parliament.